June 28, 2013 ~ OK, we are still in Rockport, Texas for this adventure. Just across the highway from the motel was the Rockport Beach. I got up really early and walked across to check it out. I wanted to get some sunrise photos, if possible. It was not quite dawn and there were a lot of clouds. The situation was hopeful for some drama. Except my lens was all fogged up. The change in temperature from the air conditioned room to the humid beach was too much for little camera. Eventually, it will acclimate but in the interim, it is not so pretty good. I took photos anyway and so... here you are. While I was waiting for the lens to adjust, I saw a lot of birds congregating on the road. There was a pile of fish heads and guts; maybe they fell off a truck because I am sure no one would purposely litter. 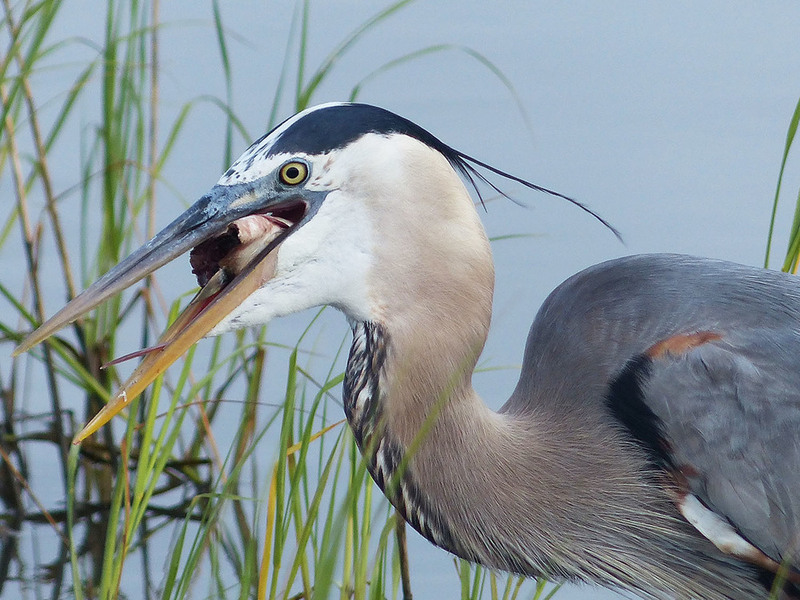 I found a Great Blue Heron carrying a fish head to the water's edge. He dunked it a couple of times and then swallowed it down. Rockport Beach is a small peninsula sandbar with access for sunbathers and waders, barbeque pits, shaded picnic tables and plenty of parking. The pass for the park is a great deal at $5 a day or a $15 season. Folks were using jet skis on the bay side but I didn't see a rental place. Maybe they have their own. But the very best part for me was at the end where there is a loop road around several nesting sites. This is the Rockport Beach Rookery. There are times when the loop road is closed due to nesting birds, but it was open this time. You can drive by on the road and look, or get out and walk up to the short fences. If you are walking, prepare to be harassed by the birds. They are being protective of their nests, and they are really noisy about it. 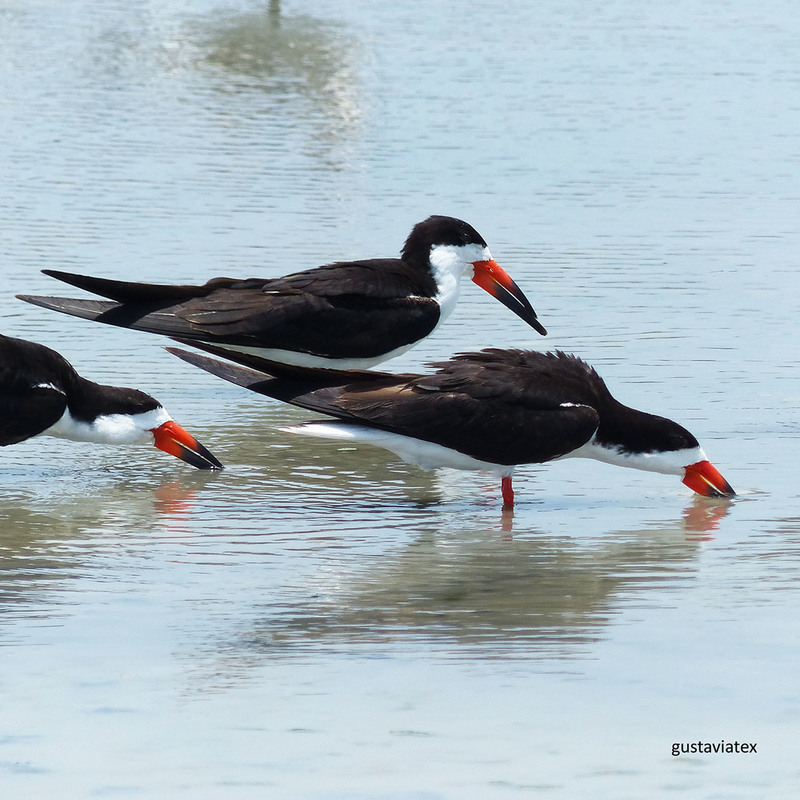 On one side there is a sandy area where the Black Skimmers are getting ready to nest. They just lay their eggs in a scrape on the sand; and both the males and females will incubate the eggs. I think it was a bit early, but I saw quite a few drinking in a nearby puddle. They are in full breeding plumage; the rest of the year they paler brown and have a white nape of the neck. Not near as impressive looking as right now. You can clearly see in the photo above the lower mandible, or bill, is longer than the top. They feed by 'skimming' across the water, using that bottom bill to scoop up small fish or crustaceans or insects. I have tried to capture them in flight "skimming" and it is really hard. I think I do have one to show you in a later adventure. 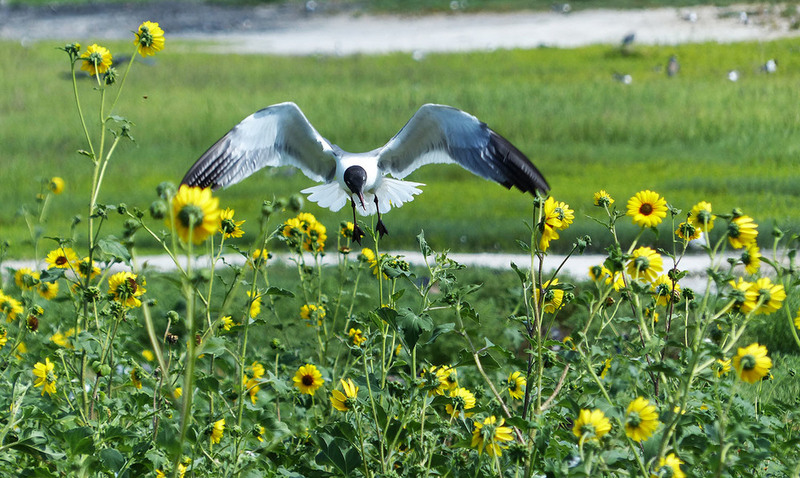 There is also a huge sunflower field with nesting Laughing Gulls and Tri Colored Herons. You can't really see the nests, but they are constantly flying in and out. And making a lot of noise. After a while, you just tune it out. 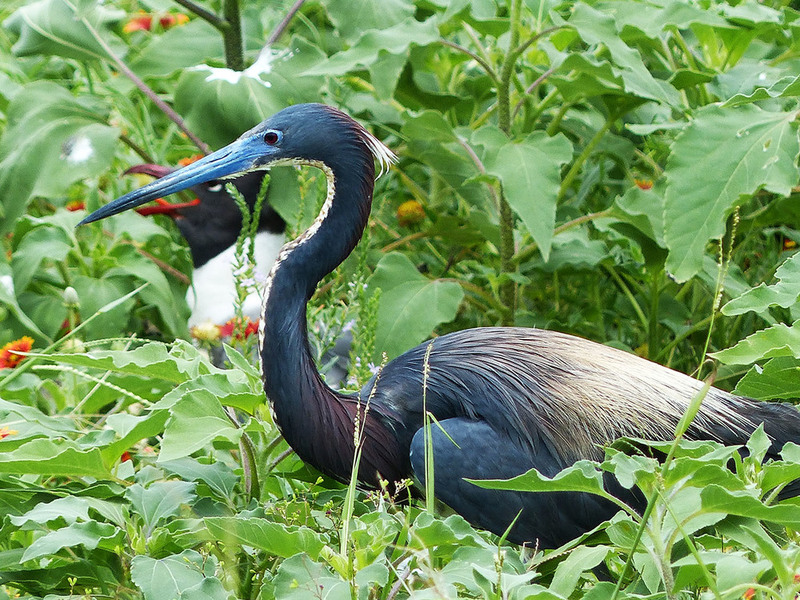 The Tri Colored Heron above nests along side the Laughing Gulls. That area around its eyes is called the lores and is bright blue, as is the bill. The plume of buff colored feathers on the back and the slight crest also indicate the breeding state. The males and female look the same, but the males are slightly larger. I didn't see any baby herons. But, look at the baby Laughing Gulls. OMG, isn't your head about to explode from the cuteness? This bitty chick seems to be exercising his tiny wings. If you look closely, he looks like he has been pecked a bit around the neck. Could be sibling rivalry trying to get whatever food the parents bring back. At first I thought the adult was trying to move the little chick back to a safer area. This was a wide sandy spot, away from the nesting sites. 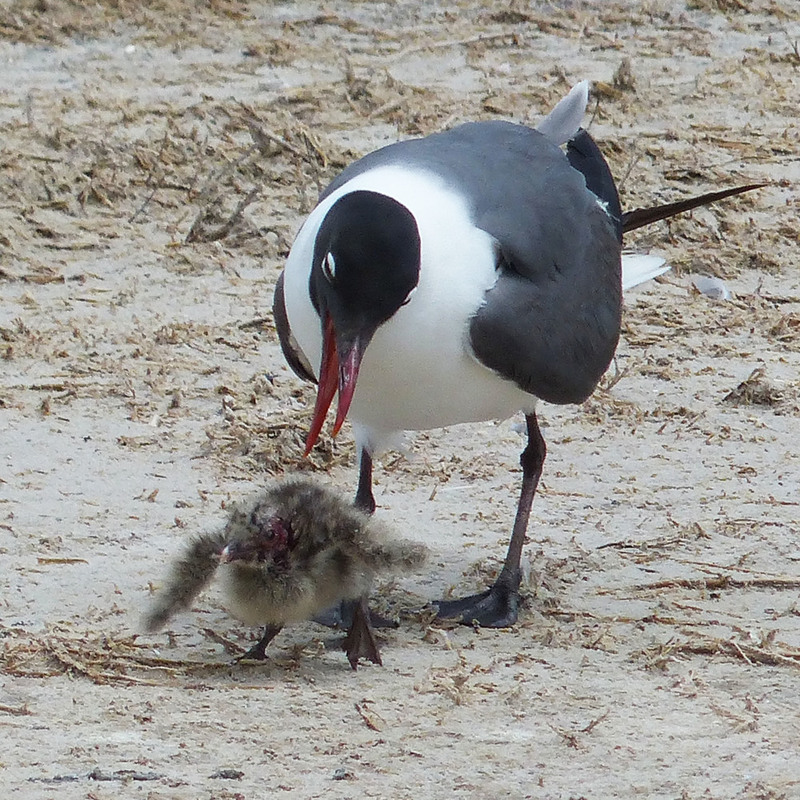 But after I watched a while, it was clear the adult was attacking the poor chick. Mother Nature is hard and cruel. We all know that, but it was hard to watch. Just skip on down to happier photos if this is too upsetting. These guys are smart enough to stay together. 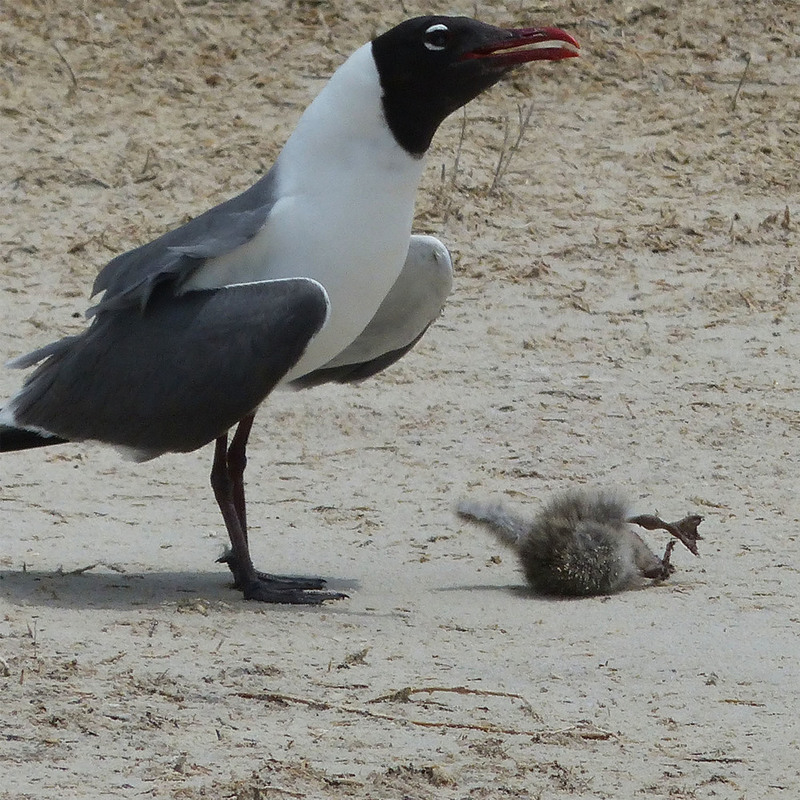 Laughing Gulls have 3 to 4 eggs that are incubated for about three weeks. The chicks don't stay in the nest but a few days. There were all sizes of babies around the area; I am sure the mortality rate is high. There were lots of predatory grackles and blackbirds in the area, too. 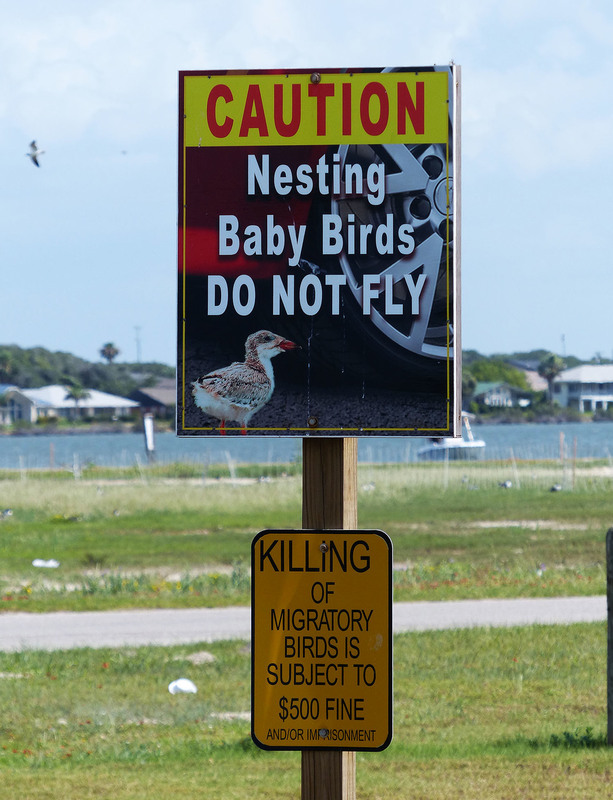 But, in Rockport and later in the Corpus Christi area, the Laughing Gulls seemed to be the predominate bird. You know how we have Grackles all around fast food places and Wal Mart? They have huge flocks of Laughing Gulls. Maybe because all the other birds were breeding, this pair of Mourning Doves looked like they were also courting. Awww. In warm climates, one pair of Mourning Doves may raise six broods a year! After taking a kazillion photos of the babies and trying to get Tri Colors in flight, we moved on down to North Padre Island. Will tell you all about that next week. Lots of birds catching fish and showing off their skills to share with you. Have you seen any baby birds this year? Baby ducks at the zoo or little cardinals in your back yard? Let me know in the comments; they are working just fine now. You can sign in with your real name or a fake one as a Guest; you don't have to do that Facebook thing.